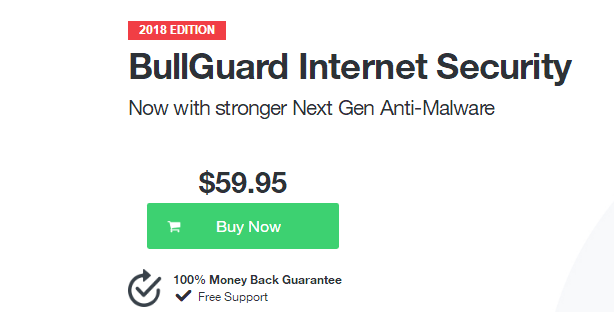 BullGuard Review 2019 – Is It Reliable? A security product become a necessary on computer. There are various kinds of cyber threats on the Internet. Once they access your system, they can ruin your important stuff and steal your financial information. You need a powerful security product to safeguard them. Which security is reliable? Which product is powerful? To help users save time and avoid wasting money on unsatisfied products, we tested lots of products and recommended the trustable ones. BullGuard is a recommended product which provides advanced protection against viruses, spyware, malware, and other cyber attackers. Learn how it works in this BullGuard review. BullGuard is a Danish company that specializes in security solutions. It has many regional offices across the world and has been trusted by worldwide users. The company combines professional technology with a genuine understanding of your needs to deliver complete protection across all your connected devices. Its antivirus gives you real-time protection against the dangerous threat like Ransomware, spyware, Trojan and Worm etc. BullGuard also offers help to safeguard your precious data, optimize your device, monitor your kids’ online activities effectively, take back lost device and perform more activities. You will find out it is a really useful tool after you give it a try. BullGuard offers many products to meet users’ different needs. There are BullGuard Antivirus, BullGuard Internet Security, BullGuard Premium Protection, BullGuard Mobile Security and BullGuard Identity Protection. You can choose to sign up 1-year, 2-year or 3-year plan. The BullGuard Antivirus has a 15-day free trial. 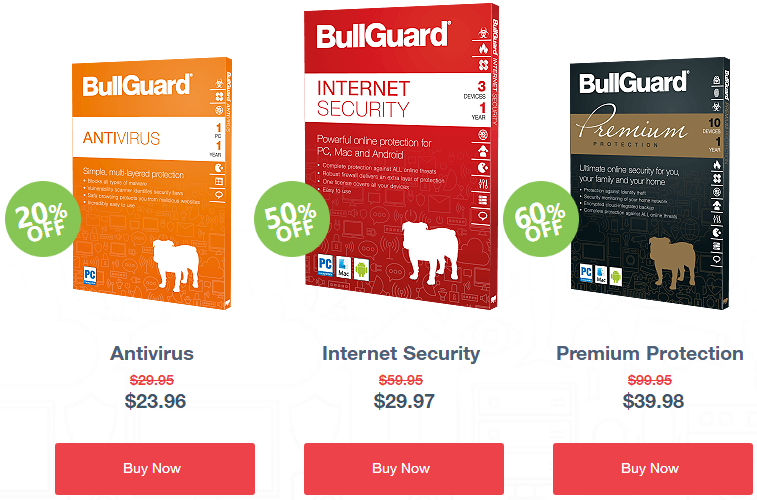 The BullGuard Internet Security has 60-day free trial. The BullGuard Premium Protection has 30-day free trial. There is a free version of BullGuard Mobile Security. BullGuard offers advanced technology and ease of use with affordability. You only need to pay $19.95 USD to protect three mobile devices for the whole year. It allows you to pay annually or monthly whatever you like. The monthly plan is flexible while you can get more savings on the yearly plan. With one package, you can benefit from effective online identity protection for your entire family, according to your needs and budget. The provider accepts multiple payment methods. You can make payment via various credit cards, debit cards, PayPal, PayNearMe, Wire Transfer or Check/Money order. In those years, hackers are very rampant and develop more and more aggressive malware to attack innocent users. Remembering the WannaCry ransomware last year? A vast number of users have been attacked. The ransomware encrypted victims’ important files and users had to pay a huge number of ransoms to recover the files. According to the reporting, hackers grabbed millions of dollars every day. Therefore, having a powerful security product on your beloved computer is a must-have. BullGuard is able to prevent and remove both old and new threats. It blocks access to the dangerous URL when you browse and eliminates the malware during or immediately after download. Its advanced firewall stops known malware at network level before they can attempt to take advantage of vulnerabilities in the operating system or popular applications. Extra features including behavioral engine, safe browsing, vulnerability scanner, parental control, cloud integrated backup, PC tune up, home network scanner and identity protection etc. are provided by BullGuard. The software is very easy to use and does not take up much space on your computer. BullGuard Antivirus is one of the lightweight antimalware solutions. 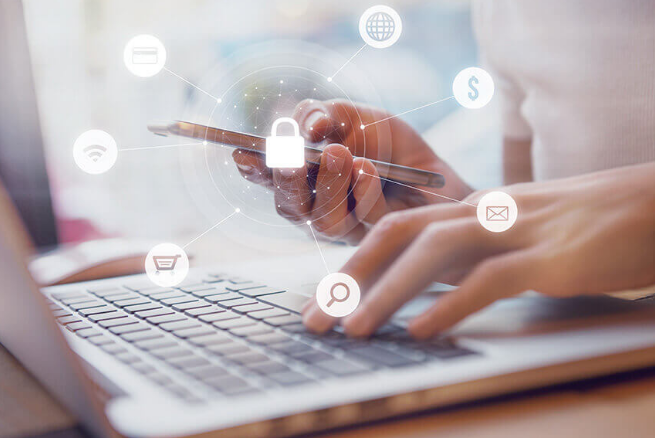 BullGuard antivirus works around the clock to ensure your devices are free from potential digital attacks in the forms of virus, malware, ransomware, and others. It uses an intelligent triple layer protection system to detect malware on your PC. Firstly, it uses the classic Signature-based way to scan known malware. Secondly, it makes use of Behavioral Detection to check code for signature and anomalies associated with malware. Finally, it locks down all detected malware in quarantine and neutralize it before it starts to ruin your system and steal information. It offers options to launch quick, full, and custom scans. When we tested the products, its performance for all the available options was consistently great. Generally, the quick scans run under two minutes while the full scan gets the job done under 5 minutes. 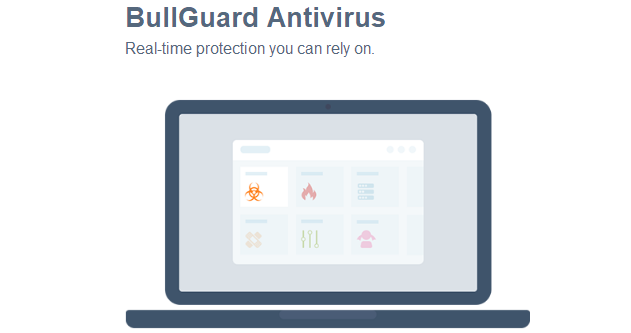 No matter you are browsing, watching videos, downloading files, playing game or shopping online, BullGuard stays alert and safeguards you all the time. The Malware Blocking is one of the strongest features with this antivirus. According to our test result, the detection rate for different samples is an impressive 99%. That can help you avoid ransomware which can corrupt your files and makes it unrecoverable. If BullGuard detects offending files, they will be quarantined into a well-designed quarantine table from which you can chose to restore or delete them. If it detects malicious codes, related files will be deleted immediately. You can enjoy safe and clean digital life with BullGuard. BullGuard not only helps you fight against malware, but also scans for vulnerability to prevent any possible damage to your PC. It constantly looks out for potential entry points and bugs for cyber-attacks that include outdated security definitions and unsecured WiFi networks. It tells you to update software and system when update package is available. You will get alert if the network you try to connect to is malicious. It will warn you if you turn off automatic Windows updates, connect to insecure Wi-Fi connections or have unsigned device drivers. The hackers won’t be able to steal your financial information by generating phishing network. Even if you don’t launch the vulnerable points scanner frequently, it still runs in the background to check your system for security issues. This tool also stops potentially dangerous programs from installing in PCs and validates applications for authentic digital signatures. According to research, most victims got their devices locked by malware after they installed unknown applications. After users clicked on a link or application file, the malware was installed immediately. They didn’t have time to react and stop the installation. Luckily, BullGuard’s keen malware detection stops infection from taking place. This feature is very popular as it ensures that vulnerabilities can be solved before damages could occur. BullGuard has Identity Protection feature which is simple and is an effective way to protect yourself from identity theft. It uses advanced technology to monitor and keep your personal and financial information safe whatever devices you use to access the Internet. You are allowed to list the details you want to protect, such as credit and debit cards and bank account numbers, driving license, passport and national insurance numbers, phone numbers, email and postal addresses, usernames and passwords. It keeps monitoring the website, social networks and the deep net where personal data is traded. In case your information has been compromised, the software immediate alerts you and offers suggestions on the most viable courses of action. It usually sends you alert via email or SMS to help prevent fraud and identity theft attempts. With BullGuard, your valuable information and data are safe from exploitation by cyber attackers. BullGuard’s firewall is available with both BullGuard Internet Security and BullGuard Premium Protection. The firewall is the additional layers of network and device protection against digital threats. A clever malware coder might get around firewall and other security protections by simply turning them off, but BullGuard defends against this sort of attack. Its firewall integrates deep into the system registry, preventing any system exploits to hijack the program and introduce malware. When we tested the product, it successfully flagged both legitimate and illegitimate outbound traffic requests. The firewall also tracks installed applications and checks security updates to make sure they have not been compromised by malicious files. That provides versatile protection for computers and smart devices without draining the battery and overtaxing the CPU to allow users to complete their tasks successfully. Hearing that viruses can hide anywhere on the Internet, many users may be anxious when using the Internet. They can’t completely enjoy the benefits brought by advanced technology. To let you browse without concern, BullGuard offers Safe Browsing. This feature does a very good job of keeping your device safe against malicious websites. It assists you to avoid being attacked by cyber threat when visiting malicious websites. The websites appear on your browser are marked with a green check if they are safe or a stop sign if they are considered harmful. The dangerous websites are blocked automatically when you try to access them while you can also add an exception if you know they are safe and insist to visit them. This is a very good asset to prevent fishing attacks. You can check email, shop and conduct other activities safely. If you have kids, BullGuard is a great option as it gives you parental control which is simple to use and effective. The parental control module can limit the access of children to dangerous online resources like adult or violent websites. By default, this module is off. You need to enable it manually. You are allowed to add various search filters using keywords or block certain applications installed on the PC. Activity monitoring features also are provided. If you need to see your children’s online activity, BullGuard helps you get the job done without having conflict with your kids. Its time scheduler assists you to limit your kids’ time of using the Internet. During the set time, there will not be Internet access on the device and they will see “This page can’t be displayed.” when they try to open a web. Besides, the Privacy tab lets you list things like your home phone, street address, and anything else to prevent your kids from releasing too much personal information on the Internet. BullGuard contains a very capable spam filter that automatically integrates with Mozillla Thunderbird, Outlook, Windows Mail, and Windows Live Mail. The spam filter can be configured to whitelist the addresses you write to or automatically trust the list of emails used by the trusted senders. It will ask if you want to display a message about the protection provided by BullGuard in the emails sent. The cyber criminals dispatch spam with malware to thousands of users every day while this spam filter never let any malicious email from accessing your inbox. BullGuard is able to block junk emails without touching a single legitimate message. You won’t miss any important email and can be free of spam as well. The Backup module is available in the latest version of BullGuard Internet Security allows you to automatically upload the encrypted files from the BullGuard Cloud directly to the main cloud platforms, like Google Drive, Dropbox, and One drive. This feature is very useful if you want to maintain your most important data safe, backed up in another location. To create a new backup profile, you must specify What, When, Where, and How, each on its own tab. The What tab, up first, lists Documents, Photos, Music, Videos, and Desktop. You can edit the precise details of the ones you’ve chosen, or add arbitrary files and folders. All the processes are secured. In case you lose your device or delete important files by mistake, you can take files back with BullGuard backup. Does your PC become slow after using it for a certain of time? BullGuard can help you keep your PC operating like a brand new one. It assists you to get rid of useless files, update software & system and perform more tasks to let you maintain high performance. With few clicks, you can get the job done without any issue. When you click Optimize in the main window’s tune-up panel, BullGuard scans for various potential speedups. Likewise, it defragments the Registry if necessary and notes any broken shortcuts. It also calculates how much space you could save by removing browser caches, Windows junk files, and application temp files. To avoid mistake, you can click for details about its Windows cleanup. After it finishes scanning, simply click “Optimize my PC”. BullGuard will work immediately to apply the changes you allow. Apart from PC products, BullGuard also has products for mobile device and it successfully protected against 100 percent of the Android malware samples used. It has anti-theft feature lets you remotely locate, lock, or wipe the device. You can view the location of a lost device easily on a map. You also can use BullGuard to block unwanted calls or texts. The software can be downloaded on a trial basis from the website. It only takes a moment to go through BullGuard setup process. Like other products, BullGuard needs you to create an account with your email address before it starts. The user interface is very easy to navigate, especially if you’re a beginner with BullGuard. You can find the straightforward functionalities without any problem. 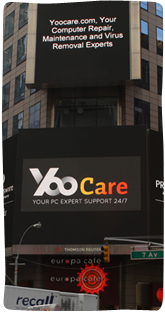 They have products for multiple Windows systems, such as Windows Vista, Windows 7, 8/8.1 and Windows 10. They work with both the 32-bit and the 64-bit of each of these OS versions. BullGuard also offers support for Mac and Android. We didn’t find conflict between BullGuard and other applications after we installed it. During our test, the software worked seamlessly even with BullGuard’s vigorous protection running in the background. It consumes only an iota of CPU power and makes sure that heavy-duty programs run smoothly. BullGuard has game booster which suspends notifications and scheduled scans when you’re playing a game or using another full-screen program. It protects you all the time while it does not interrupt with your work, study or entertainment at all. If you have any problem is using BullGuard products, the 24/7 support is available across all three premium product lines by both live chat and email. We were surprised by their fast and professional answer. They are very helpful and friendly. It is a pity that telephone number is not available. In addition, the company maintains a comprehensive online knowledge center for ironing out the most common usage issues. Your issue will be fixed effectively. BullGuard is a respectable choice for antivirus protection. It is very useful tool to safeguard your computers, smartphones, tablets, and even your smart home devices from being penetrated by malicious presences. It works on a signature database and monitors the internet 24 hours a day to deliver effective security solutions to the latest threat. This is very important as the hackers upgrade their malware continually. It scans for potential threat and prevents any possible risk to your system and data. It is able to quarantine harmful files so as to keep the virus isolated and prevent it from spreading or causing damage to other files. BullGuard has safe browsing and firewall to keep you safe online. You also have email protection, private information protection, gaming protection and parental control etc. with this security product. BullGuard is an advanced, useful, reliable and affordable service.